Motherwell FC gaffer Mark McGhee today (Thursday) received the Ladbrokes Scottish Premiership Manager of the Month award for December. McGhee led ’Well to a memorable 2-1 victory at Celtic Park last month in addition to home league victories over Dundee and St Johnstone. “It’s a great award,” McGhee said. “I think it’s something we all try to win. We are delighted to win it. “This has my name on it but it’s a team effort. McGhee said the recent wins had been “a huge boost” to Motherwell but he stressed that they “aren’t out of the woods yet”. He said: “To beat Celtic at Parkhead is always a big thing for any Scottish club. At the moment they’re the ones to beat. 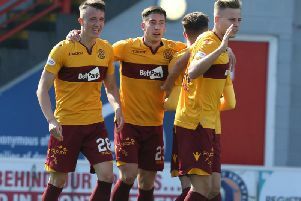 Although McGhee stressed that he had absolutely no complaints about the team he inherited from sacked ex-Motherwell gaffer Ian Baraclough, he said that the lads were now training with an intensity which had got them stronger and fitter. “As a group they have demanded of each other and got themselves working harder in training,” he said. “It just reflects in the type of performances they’re putting in. “Scott McDonald is in the best form I’ve seen him in for years. Louis Moult is a terrific striker who scored a fantastic goal on Saturday. McGhee said he was relishing the prospect of taking on Cove Rangers at home in this Saturday’s “very difficult” William Hill Scottish Cup fourth round tie. “We know we have to prepare the same,” he said. “Just because I’m the Manager of the Month, I’m not going to show that to Cove and they’re going to lie back and accept a defeat. As a warning that Motherwell shouldn’t take Cove Rangers lightly, it was only two years ago that they were defeated 1-0 at the same stage by minnows Albion Rovers. “I don’t think the Albion Rovers game bears any relevance today,” McGhee said. “It’s a different set of lads and different circumstances. “It’s a team in great form with every confidence that we can go and win this game. I don’t expect any catastrophic performance. McGhee said that he had been involved in a giant killing as manager of Wolves in March 1998, when they won 1-0 at Premiership giants Leeds to reach the semi-finals. On the other side of the coin, McGhee said he had lost a cup tie to “a team probably lower ranked than Cove” when playing for Hamburg in the 1980s. “In every country the cup has that mystique that a small team can beat a big team like that,” McGhee said. Switching his attention to the league table, McGhee said he felt ’Well needed to reach the 40-point mark this season to stay above the Scottish Premiership relegation play-off spot. “If we’ve got that by the end of January that will be fantastic,” he said. “But however long it takes it, that will be first and foremost. McGhee answered “probably not” when asked if he would be bringing in new players this month. He has a fully fit squad for the Cove Rangers game.